VOLODYMYR BALAS was born August 29, 1906, in Rohatyn, Ukraine. He studied at the Polytechnic in Lviv and at the Academy of Fine Arts in Warsaw, Poland. From 1939 to 1944, Balas taught graphic arts at the Institute of Fine Arts in Lviv. After the Second World War, he emigrated to Canada, then to the U.S.A, and resided in San Diego, CA, until his death on April 18, 1980. 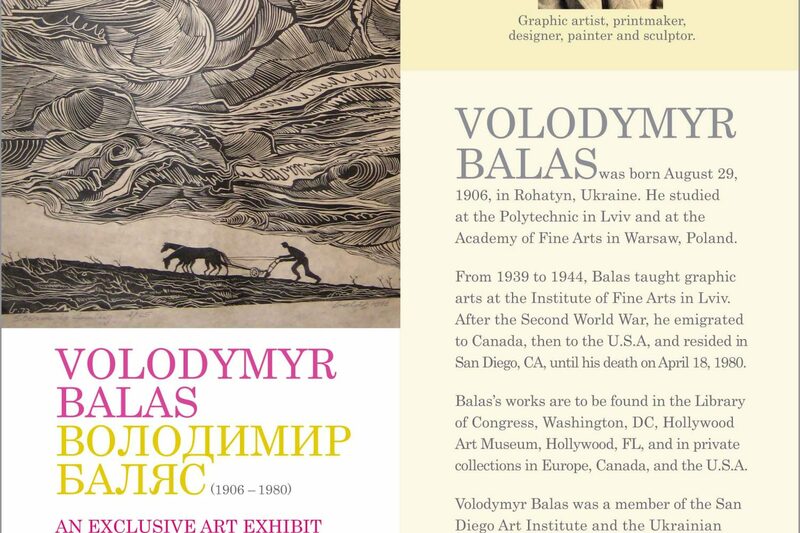 Balas’s works are to be found in the Library of Congress, Washington, DC, Hollywood Art Museum, Hollywood, FL, and in private collections in Europe, Canada, and the U.S.A.
Volodymyr Balas was a member of the San Diego Art Institute and the Ukrainian Artists’s Association in New York. The artist’s last exhibit in Toronto was held in 1978 at KUMF Gallery. THE ARTIST’S LAST EXHIBIT IN TORONTO WAS HELD IN 1978 AT KUMF GALLERY.